India celebrates many festivals throughout the year. All the festivals, irrespective of religion, are celebrated with joy and enthusiasm. The biggest festival in India is Deepawali or Diwali (Indians call it as Diwali), “Festival of Lights”. It is also a Business New Year for business persons. It is 5 days long festivals and each day holds its special meaning. Deepawali does not occurs on a fixed date. Its occasion occurs on a full moon day and depends on when another festival called “Dussehra” is celebrated. According to Indian Mythology, King Dasaratha of Ayodhaya orderd his son Ram, along with his wife Sita and Brother Laxman, for a 14 years exile in a distant forest. During the exile, his wife Sita was abducted by a demon called Ravana, King of current known country Sri Lanka, by deception. Lord Ram travelled all the way to Sri Lanka along with his army on Monkeys and fought a battle with demon Ravana. The day he won the battle, that day is celebrated as Dussehra which symbolizes the victory of Good over Evil. After defeating, he returned to his hometown after 14 long years, Ayodhaya, where people celebrated his homecoming by lighting up mud lamps in the night. That day is celebrated as Deepawali. In India, Deepawali occurs 15 days after Dussehra. They both falls on full moon day. The date is not concrete, and it shifts to any day in either October or November. People await eagerly for the festival. Those 5 days are declared government holidays and company even give some extra holidays so that people could go home to celebrate. The preceding month, the whole house is cleaned, and people generally buy new clothes and items like car, property, gold etc. as for Indians, it is an auspicious time. As the day of festivals nears, people decorate their house with lights, and some sacred items like flower garlands, buy sweets and new clothes and crackers for the day. 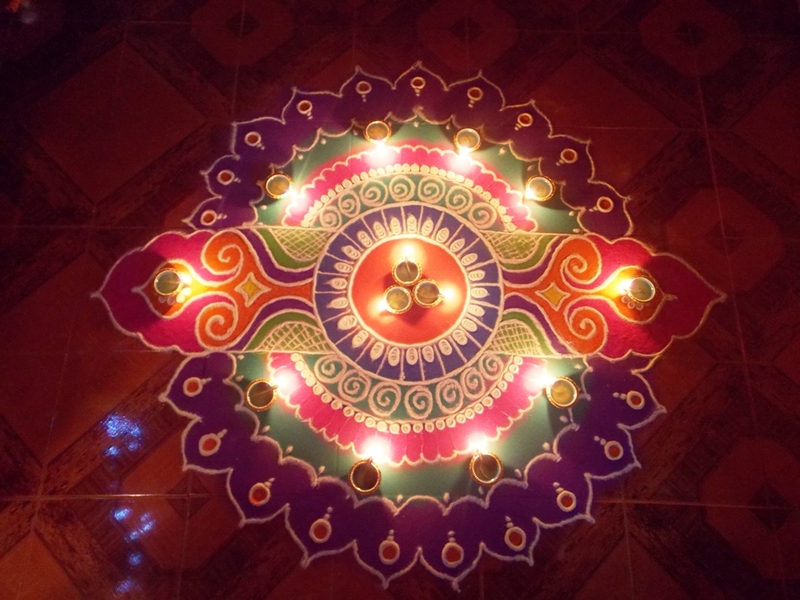 From the first day, people start to decorate their house with mud lamps, called “Diya” in India, in the night and draws “Rangoli”, portrait using colored powder, on the floor in front of their houses. On the day in the evening, everybody wears new clothes and worship Goddess Laxmi (Goddess of Money) and ask for her blessing for a successful business year. Usually, it is followed by burning crackers and a delicious meal. People exchange sweets. In India, every occasion is followed by exchanging sweets. The workers are given a bonus and a box of sweet, which is handed over only by a girl child. Deepawali is a beautiful festival, during which the while country eliminates darkness by lighting mud lamps and celebrate with a lot of joy. It symbolizes no matter how big the darkness could be, a single lamp is enough to eliminate it.